Aaron Rodgers is back for the Packers, but the Panthers are coming off a big win over Minnesota. 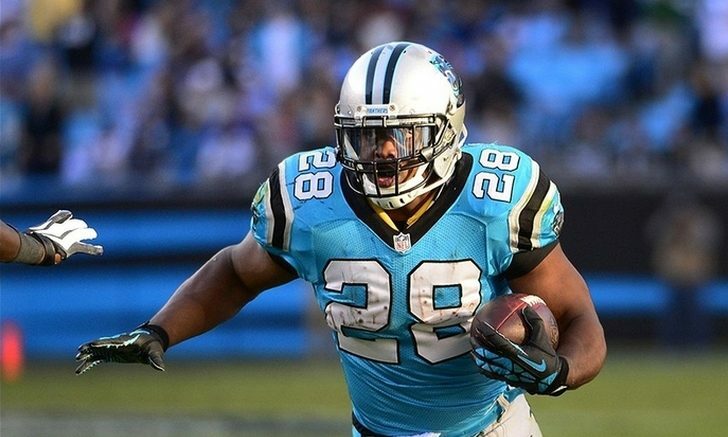 Running back Jonathan Stewart was named NFC Offensive Player of the Week after his first career three-touchdown game. The Chargers are hot, and the Chiefs are not. Granted, Kansas City won last week, but that felt more like an obligatory “we’re not that bad” statement and also a reminder of how hapless the Raiders really are. The Bolts haven’t had any signature wins lately, but that doesn’t mean they can’t get one here during a stretch when both the offense and defense are dominating. Playing a road game in December at Arrowhead is always daunting, but the Chargers have basically been playing road games all year. Anthony Lynn faces a tough task in trying to outsmart an Andy Reid-coached team in the regular season late in the year (note that I said regular-season), but he’s been pushing the right buttons of late, and an AFC West title after an 0-4 start is in sight. Pick: Chargers. This is a last-minute addition to the fold, and perhaps you can call it a chance for redemption after watching the Chargers fizzle out on Saturday night. These are two wounded, underachieving teams, but the Cardinals traveling all the way east off a surprising home win over Tennessee with a busy injury report seems like a losing proposition. The Redskins have struggled of late but aren’t really all that bad, and should get back in the win column in front of the home crowd. Pick: Redskins. There are reasons to think this game will be close. The Ravens could certainly start sluggish off an emotional, physical game in which they blew an 11-point lead to the Steelers. The Browns are more desperate by the week and almost won last week. But eventually, reality will set in during this game. The Browns are the team that might be emotionally spent after being unable to hold a 14-point lead against the Brett Hundley-led Packers, and the Ravens know their margin for error is gone after falling to 7-6. With the Browns, Colts, and Bengals on tap to close the season, Baltimore will not be messing around as it attempts to make the playoffs for just the second time in five years. Pick: Ravens. Aaron Rodgers is back, so you know what the whole world is thinking: the Packers are going to win out and make a run in January. Not so fast. I’ve been high on the Panthers all year, and they are fresh off a big win over Minnesota last week. Carolina has a strong defense and Cam Newton is making big plays just like two years ago, and who really knows if Aaron Rodgers will be his dominant self after being idle for so long? I’m not expecting him to instantly come back and pull a miracle like he did against the Bears in 2013. Green Bay is a playoff long shot anyway, and Carolina can finish off the Pack with a win. Pick: Panthers. I’m going pure sentiment here and taking the Rams. Even though LA is a mere 1-4 against the conference’s top dogs this season, it is hard to imagine it will get swept by a Seahawks team it has played very well against in recent years. The Hawks have actually won three straight in this series, including a 16-10 road win in Week 5. But I can’t envision the Rams’ offense being as dormant this time around, and Seattle’s offense and MVP candidate Russell Wilson have long suffered against the Rams’ defense. Count on Wade Phillips to have something good cooked up, and Jared Goff to make just enough plays (or even play, singular) in the fourth quarter to give LA a stranglehold on the NFC West. Pick: Rams. Is there any doubt, really? Since the end of 2002, the Patriots have had a grand total of six two-game losing streaks. That’s an average of one every two-and-a-half years, and since their last one was two years ago, we’ve still got half a season to spare. Gronk is back in the fold, and that should help the Patriots atone for going 0-for-11 on third downs Monday night in Miami. This Steelers team, winners of eight straight, has basically been begging to lose, but have not found a willing suitor yet. But the Ryan Shazier-less defense will be exposed by a Patriots team that always plays its best when things look their worse (yes, in Foxborough, a one-game losing streak is a catastrophe). In 2010, the Patriots got slaughtered by the Colt McCoy-led Browns, 34-14, and had to go to Pittsburgh on a Sunday night against the eventual AFC champions. The result? A 39-26 Patriots whooping that wasn’t even as close as the score indicated. Pittsburgh may end up in the Super Bowl again this year, but I’d count on a similar fate as that 2010 bunch. Pick: Patriots. Give me a chance to bet against a Falcons team primed to play down to its competition, and I’ll gladly take it. Atlanta is “hot” of late, considering they are 8-5 after a 5-4 start. But come on, these are the Falcons in crunch time. Just when everyone starts telling them how good they are and that they’re “back,” they’ll let you down. This is a good spot for Tampa Bay to have one last potential bright spot in an otherwise miserable season. A win might be asking too much, but they hung tough in Atlanta with Ryan Fitzpatrick under center a few weeks ago, and it’s unlikely they’ll get embarrassed two years in a row at home in primetime against their division rival. Pick: Buccaneers. Be the first to comment on "NFL Week 15 Picks: The AFC Championship Game Preview and a Battle for NFC West Supremacy"